The Florence Historical Society was established as a non-profit organization and incorporated on June 25, 1969. Its purpose is to gather and preserve items of historical value relating to Florence, Kansas. The Society meets once a month on the first Tuesday of the month. 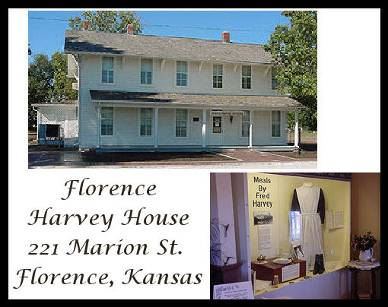 The Florence Historical Society operates the Harvey House Museum, and maintains collections of papers, documents, photographs, and objects from Florence's past. 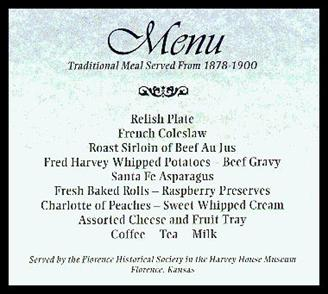 If you would like to contribute items to the museum, arrange a tour or dinner, or are interested in becoming a member, please email hhouse@florenceks.com or call 620-878-4296. After a long-awaited reprinting of “Century of Pride,” copies of this treasure are available for purchase! In 1972, the year of the Florence Centennial celebration, this book was compiled from all the available facts, memories and anecdotes, and those passed down through generations of the families who originally settled in the area during the early years. Starting with the first covered wagon to pitch their campsite on the dirt among the Native Americans, on up through to the 70’s, this is a highly interesting book full of Florence history! Including the shipping, they are available for $15 apiece. For information how to order, please EMAIL hhouse@florenceks.com! “Feasting on Asphalt,” a series with Alton Brown on FoodTV, visited Florence the weekend of the Spring Fling in 2006 and filmed at the Chuckwagon, the Legion, at the gym with the games and cake auction, and then also featured a dinner at the Harvey House Museum. with suggestions or comments about this site.